The 3rd National Agrarian Reform Fair, organized by the Landless Workers’ Movement (Movimento dos Trabalhadores Rurais Sem Terra – MST) in São Paulo, held a seminar this Friday (4) on "Experiences to Promote Agrobiodiversity," in which participants talked about agricultural practices that respect the environmental and social aspects of each biome. Renowned Brazilian chef Bel Coelho participated in the seminar and highlighted how important this debate is for her work. “I started to research Brazil’s native products and had the chance to travel across the country visiting farmers. So I became very aware of this matter and this kind of agriculture. And from a culinary point of view, it is so interesting. I have a menu dedicated to Brazilian biomes, with each dish especially made based on a biome. When I served this menu for the first time, I think 90% of the people who ate it were not familiar with the ingredients,” she said. During the seminar, Coelho said that a conscientious management of food production is crucial to make sure Brazil and the world have a sustainable future. “I think family farming, agroforestry, and organic farming – that is, conscientious, organic farm management – are the future for us to keep forests alive, and to be able to feed the whole country,” she argued. 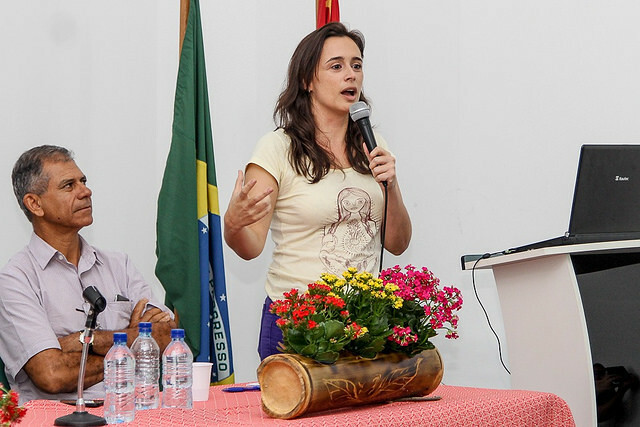 Mariele Oliveira came to São Paulo from Bahia state, where she works at the People’s Agroecology and Agroforestry School Egídio Brunetto. She talked about the experience of the so-called "agroecological backyard gardens," which they have been developing since 2013. Now, there are more than 500 productive backyard gardens in Brazil that follow the principles of agroecology and sustainable food production. “In these agroecological backyard gardens, we grow annual crops, perennial crops, making sure families have food, generating income for them and replenishing the soil. Productive backyard gardens are a practical way to spread the idea of agroecology and also promote agrobiodiversity,” Oliveira said. Other successful experiences are the agroforests developed in MST settlements across the country. Rafael Santos, an activist from the Landless Workers’ Movement’s Production Sector and a resident of the Luiz Beltrame de Castro settlement in São Paulo, has become an expert in the topic. “When we talk about agroforests, we’re talking about bringing back cultures that capitalist agriculture has used up. The MST has been working to bring back traditional crops adapted to each soil, to the reality of each farmer in terms of labor and economic and environmental aspects,” he explained.